If a chess player is really good at endgame play it can be guaranteed that he possesses a clear understanding of the Lucena Position. Luis Ramirez de Lucena, a Spanish author is believed to be the person behind the discovery of the secrets of the Lucena. A clear and sharp understanding of the Lucena can convert a draw into victory or a loss into a draw. Different opinions have emerged on the importance of Lucena Position. Efstratios Grivas, in his famous book Practical Endgame Play - Mastering the Basics says, "It is the most important theoretical position for the conversion of an extra pawn." It is not a complex position in comparison with other endgames. Some of the typical characteristics of Lucena Position can be defined in the following methods. Both Black and White have one rook each and one pawn for White only. The White pawn can be on the seventh rank and it should not be a rook pawn. The king will be in front of the pawn on the eighth rank and the position of the Black king will be very near, typically two files away. You can find the Black rook on a file adjacent to the king and the pawn. The position of the White rook will be on a file between the White king and Black king. If the player with the White pieces can play accurately without making any mistakes he will easily win over his opponent with Black pieces irrespective of whose turn it is to move. Great players are of the opinion that the endgames deserve more importance than the openings because endgame theory is finite. The rapidly changing nature of opening theory makes it less important and the endgame theory always remains constant. That is why the Lucena Position assumes paramount importance. Since the Lucena is less confusing, one can easily learn this position inside out. Then a player can handle the rook endgames with great amount of comfort and ease. Modern day chess has become a global sport with a huge amount of prize money and with a great number of followers. Leading players of the modern era have become superstars with colossal popularity and the level of competition has also improved to a great extent. Even today some of the modern greats become eloquent when they speak about Lucena. It is a clear manifestation about the popularity of the Lucena Position. It is a good piece of advice. I appreciate it. 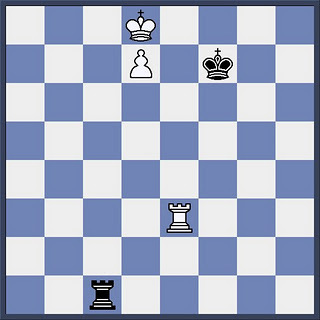 I am not a professional chess player by any standard but I can see that there is a simple beauty to this endgame. This looks usable by beginners too who can use this to their advantage against their opponents. I play chess with my brother and father very often. I learned this technique a few years ago. The Lucena maneuver once helped me beat my boasting brother. And it was a real pleasure to see the expression on his face when I won what seemed a drawn endgame. It is very important to think in the endgame in order for our play to be effective. We usually play the endgame without the bishop, knight and queen as rook endgames are most frequent. We should learn the principle lessons of the Lucena and maintain these things in our mind. Rook endgames should be steered towards this position. When we know how to force victory from here it should be very easy to win the game. Yes, it is of sheer importance to handle the chess endgame correctly. Clear understanding of the Lucena Position can take your game to the victory otherwise one may flounder with a draw. As opined by the greatest players that endgame receives more importance than the beginnings since endgame theory is finite and remains constant unlike the openings. It is said to be so finite and constant that one could get a mastery over it with much less effort than that required by the various opening theories. This has to be the starting point for any chess novice on rook and pawn endgames. The stronger rook gives check to the defending king to freeze him out of the game, then goes to the fourth rank. Then the stronger king comes out and zig-zags down to the fifth rank, dodging checks and never leaving the pawn hanging. Finally the fourth rank rook moves in front of it's king to shield any further checks and the pawn is free to promote. Very simple, yet how many beginners would find it unprompted? Join in and write your own page! It's easy to do. How? Simply click here to return to Playing Lucena Position Endgames.